Who knows what kapitalist kumudgery of Intellectual Property Rights(TM) the progs at Nobel have succumbed to in their equal equalness for Peace NOW!!! Fair use is only for the fairest of them all, what did your talking mirror tell you today my pretty? Oooooo..... My mention of the Nobel Clearinghouse Sweepstakes made the big time! This is better than Beet of the Week! If I don't get the Peace Prize for my submission, I'm certain to receive the Nobel Economics Prize! The GOOD news is that you don't have to buy any magazines to win. The BAD news is that you will soon not be able to afford to buy any magazines. Or food. Or fuel. (Gasp!) Oh boy oh boy oh boy! I might finally get my hands on the prize and be equal with everyone again! Wait a tick. . . did some one hack Red Square's profile? It sounds like an advertisement. (sniff) (sniff) I smell a capitalist, and I know that smell anywhere. $.$. Haliburton (sp)! now now Commissar Elliot, if you win the prize, all will be unequal again until ALL win prizes! SELFISH KAPITALIST PIG!!! SPREAD your WEALTH around! According to Comrade Album, we should be receiving our Nobel Prize in the mail anytime soon. Do you think mine will automatically be forwarded to the re-education camp, where I am currently located? I must make room on my mantel (beet box) for when my Nobel Prize arrives. It will go nicely next to my gold medal which I won in the 2020 olympics. Does it come in any other colors? I'd like it to match my shovel. I smell that too Komrades! The kapitalist smell of money and prizes!?! Has the kollective gone mad? Only I can sell millions of copies of my famous book to unsuspecting proles and not be called a kapitalist (*spit*... er, what's that Laika? aaah, transmission received, thanks noble space dog...) Ahem!.... The Party™ is merely fund raising, so that we may institute the 500th 5 year plan to do away the ruling class bourgeoisie that create all the poverty on earth! Hail The Glorious Proletariat Workers Paradise! *Vidkun Quisling is awarded "Peoples' Peace Prize"
Why didn't our Dear Leaders Lenin and Stalin also win Nobel Peace Prizes? Can a Nobel Peace Prize be issued post-mortem? This inequality of outcome must not stand. Also, forgive me Almighty State for secretly desiring a Nobel Peace Prize myself. Forgive me dear State for desiring equality with the not-to-be-equalized State equalizers. I can't wait for my Nobel prize, I hope they deliver to Ry'leh, or else I'll have to add picking it up to the long list of things to do when the stars are finally right. It will be number 537, just after exterminating those racists in denmark who denied the great leader his right to dictate the olypics, just before I eat the souls of everyone on the Nobel prize council for not awarding the peace prize to the great leader while he was still a great leader in the senate, or while he was in ACORN. "Hit back twice as hard" definatly deserved a Nobel peace prize. Sent off for my Nobel just now. I don't really need the medal but I know they'll send it as a formality. What I really need is that prize money so I can pay off the back taxes that my unvetted czars owe. That's just it though, I don't have the Peace prize, ergo, I'm unequal to all, and I want to be equal to all. Wait a minute. . . I thought it was crap. I think it's the SPAM. I ought to know, I have visited SPAMTown before, and that smell doesn't go away. I, got a Peace Prize. I'm typ'n on ma computa, Peace Prize. Darn it RR, I'm going to have that stuck in my head all day now. Comrade Opiate, I denounce you for breeding KKKapitalist lies doubting Our Glorious Leader's ability to properly provide for the Collective. Haven't you been taught that The One will give you the Korrect amount of food and fuel as only He can decide it? For you: turn in any Illegal weapons in exchange for a Peoples' Shovel and report to your local elementary school for mmmmm.... mmmmm.... mmmmm.... Re-Education. 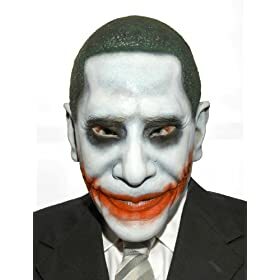 For those Open-Minded™ comrades who may have been infected by his traitorous post: Obtain 1 Chia® Obama idol and say 200 Hail Obamas to cleanse yourselves. Holidays typically involve a certain amount of discretionary spending in celebration of that holiday, and Halloween spending is already beginning! Halloween spending includes setting up hayrides, mazes, haunted houses, and popular Halloween costumes. Halloween also means more candy and Pepto Bismol to go with it. This year, Michael Jackson costumes are already selling at a record pace, and lots of people will be out there with Thriller costumes. Halloween is fast rising as one of the biggest spending holidays. People are even dressing up their pets for Halloween – who doesn't love an insipid and annoying Chihuahua in a tutu? There will be plenty of Halloween spending of short term loans or credit cards (link deleted) on cool costumes and events for sure this year. It's not that simple komrade, Karl is in charge of the SPAM around here... happy hauntings kulak krony kapitalist! What did that even mean? Why is the People's Time being wasted on talk of Thriller costumes and tutus for your dog? I can't even understand these KKKapitalist freaks anymore.